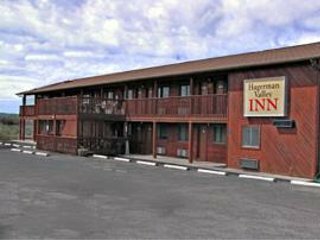 The Hagerman Valley Inn is located in the scenic Hagerman Valley, considered the "banana belt" of southern Idaho. The Snake River Grille is adjacent to the motel and has excellent food including breakfast, lunch and very nice dinners. 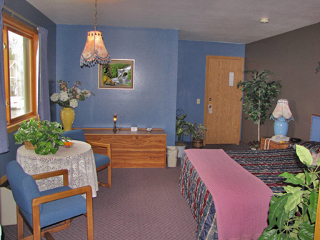 At the Hagerman Valley Inn you will experience the comfort and convenience you deserve at a quality hotel. 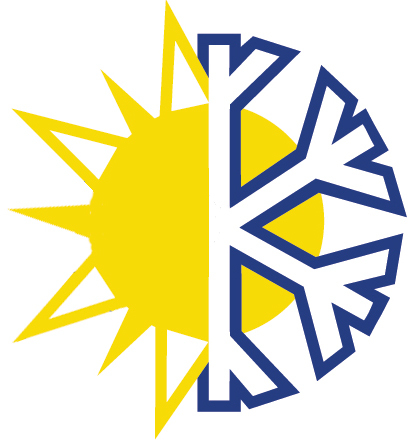 We are the perfect hotel for families, friends, large or small groups, tourists, or for those just passing through the beautiful are of Hagerman. 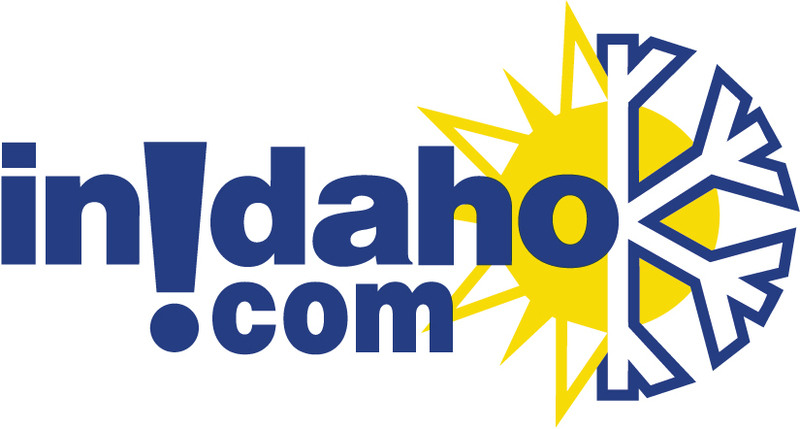 InIdaho has been partnered with Hagerman hotels and motels for about 21 years. 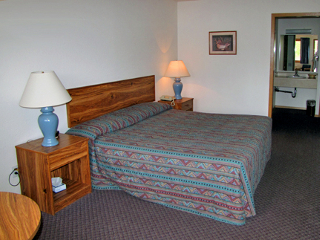 We guarantee the lowest prices for Hagerman Valley Inn reservations. Our local idaho business is staffed by friendly and efficient employees who appreciate that you choose to make your reservations for Hagerman Valley Inn with us. Our rates are always the same or lower as calling the Hagerman Valley Inn direct. 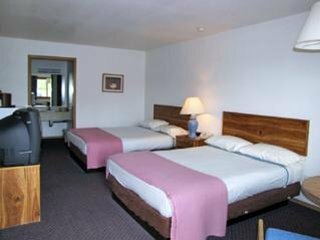 We also offer group rates for Hagerman Valley Inn - just contact us! Enjoy a romantic dinner for two with 1000 Springs Tours that lets you witness some of the most spectacular water displays arising from the aquifer. The famous "Thousand Springs" waterfalls and Riley Creek Falls erupt from rocky canyon walls and gush to the river below. Chose from the Hagerman Valley Inn, Billingsley Creek Lodge or Thousand Spring B and B all located in the scenic Hagerman Valley, considered the "banana belt" of southern Idaho. Subject to availability and does not include tax or tip. 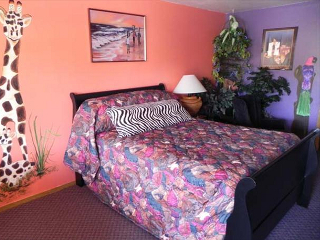 This guest room offers two queen beds, air conditioning cable TV and high speed internet. This garden themed suite includes a queen bed, cider & candies and a small fountain. Also included in this room is air conditioning,coffee maker, microwave, refrigerator, flat screen TV w/Cable & DVD and high speed internet. Room is located on the second floor. 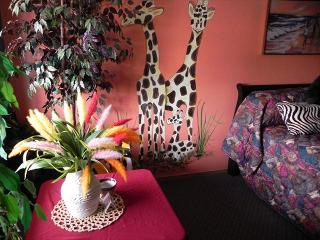 This safari themed suite includes a queen bed, cider & candies and flatscreen TV w/Cable. Also included in this room is air conditioning, coffee maker, microwave, refrigerator and high speed internet. 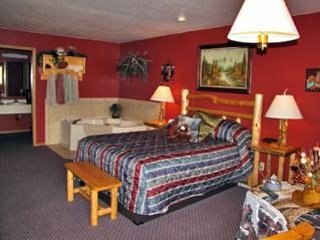 This suite includes a log queen bed, log furnishings, cider & candies and jetted tub. Also included in this room is air conditioning, microwave, coffee maker, refrigerator, Cable TV & DVD and high speed internet. 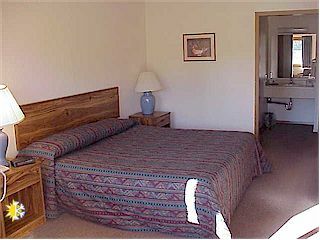 This guest room offers a king bed, microwave, refrigerator, air conditioning cable TV and high speed internet. Please note: Guest reviews may mention certain amenities that may no longer be offered with Hagerman Valley Inn. Please check the amenities prior to booking to confirm. "Cleanliness was good, Friendly staff as well. The office itself was never actually 'open' that I noticed, however you were always able to reach them via the phone system. Coffee ad newspaper are all the offer in the morning, for cost would have figured fruit and maybe something else. Fridge and microwave in room is nice to have. Overall satisfied, but for cost would have expected a little bit more. I guess it would be on par with a Motel 6, which I was expecting this to be above that. " "The accommodations were very good, and the inn's central location to other nearby sites and local dining were excellent." "We arrived early on day one. We needed to get ready for our dinner so the lady got our room ready and hour early so we could be on time. Very accommodating and willing to make us feel like we we3re important. We have stayed there four times over the past then years and find it a very convenient place. We grew up in Buhl and it feels like home since we spent a lot of time in the valley. My grandpa was the superintendent of the power plants at Thousand springs, Malad and Lower Salmon in the early 1950's. My mother graduated from Hagerman High in the 1930's. See you next time...."
"Turns out that the Garden Suite is located on the second floor, which is not so easy for us old timers, plus the bed was not all that comfortable. The food wasn't all that great at the place next door either. The locals were great and we had a nice time driving around to the sites. Make sure you visit the little pizza place, they have great pizza and sandwiches, plus the ice cream was outstanding."